Celebrities hunt for antiques across the UK. Husband-and-wife vocal coaches David and Carrie Grant swap singing in harmony for battling it out with antiques. Browse content similar to David and Carrie Grant. Check below for episodes and series from the same categories and more! The mission, to scour Britain for antiques. -I'd do that in slow-mo. -..but it's no easy ride. Today it's all about hitting the right notes. and you're driving it like a granny. That will be the one. for a spot of competitive antique-ing. -"I'm going to beat you." and for 30 years you've been losing. David Grant is an '80s pop icon. clocking up 14 hits and becoming a television favourite. David Grant, the man himself, for the Yellows. she represented the UK at the Eurovision Song Contest. David and Carrie have become familiar faces on our screen. or are you going to go back to those smelly old ones? it's shopping skills they'll need today. but I am good at spotting a bargain. You know the cost of nothing. You don't even know the cost of a loaf of bread now. and suddenly gain this gift of knowing the value of something? Because, baby, I'm not going to be buying bread. if you're going to go and buy loaves of bread. Will Axon and Mark Stacey. 1961 Morris 1000 in custard yellow. And I hear Mark is a fan of Carrie's European past. with I'm Never Gonna Give You Up. Not encyclopaedic, but I love Eurovision. Well, that concludes the judging from our expert jury. Time for our hopefuls to meet their mentors. -How are you, Mark? I'm David. David, Will. How are you? Nice to meet you. How are you? We are so looking forward to this. We are. We've decided our pairing. -Yeah, because I love Eurovision. Come here, you. Come here and give me a man hug. No, I think you'll find the man with the keys always wins. Take a little look in there, you'll see my handbag, reserved. Try and start the car with a handbag. I'll keep the keys. Come on. You talk about starting the car. Let's do it. -And it's got a horn! and their journey starts off in Landbeach in Cambridgeshire. before heading north to Norfolk for an auction in Downham Market. -Are you good at shopping? -I'm really good at shopping, yes. -Are you good at bargaining? I'm relying on you heavily for everything, to be honest. That worries me a bit, you know. You know, it's not that I mind losing to her. Not really. It's just that it would make my life unbearable if I did. -It's just bragging rights at home, isn't it? Well, let's get things moving, then! to start their shopping adventure. -Will, how do you do? David, yeah. I'm Stan from Stantiques. Like what you did there, Stan. Have a look round, guys, see what you can find. -Let's have a wander, David, let's have a wander. Straight in with a...shooting stick. Are you a man of country pursuits? No! What do you think? A lot of people have one. you want the old bamboo one with the cane seat, really. -But, you know, it's a start, you're showing that you're keen. How do you feel about dead animals? Oh, I like this stuff. You see what I did there? the 1947 Cites agreement, don't you know! I'm liking the wild boar. Yeah, how much is the wild boar? Well, it's a price, at least we've got something to think about. even at a rural auction. -I need a week in here! So, plenty of interesting things to get you going. Do you know, that reminds me of Will! -Because he's such a bore! How long did it take him to think that one up? Do you think we should split up? Yeah. I mean, yeah. I don't know what to look for, but, yes. I think you've got an eye. Oh, yeah? Nothing like throwing her in at the deep end, Mark. is actually from my childhood home. Mark, I really like this as a set, look. and it is very in vogue in certain areas. It would look lovely in your house. So I've got to stop buying for myself? Yes, but that's a very common thing to do when you are shopping, isn't it? Now, I've found something which I think you'll hate. You just took that out of your pocket. -Were you trying to nick it? No! I just think there's something about it. I think this is an antique. but antique tribal stuff is quite collectable. You can see there's a lot of dust and dirt in there. -You hate it, don't you? Lordy, this could be a long day. Meanwhile, in Landbeach, David and Will are still browsing. these all look like they should have cutlery in. -Let's see if there's anything in this little box. Go on, open her up. -Well, there you go, the fish service. The Victorians loved to complicate things. There's not much of a market for that, these days. -Do you use a fish service? Now what have you found? -That's kind of cool, isn't it? What kind of age would that be? it's got to be sort of turn-of-the-century, hasn't it? So this could be a century old? -Do you think this is the kind of thing that might be of interest? I do, I quite like it. I quite like it. Again, it's got a sort of sculptural quality about it, hasn't it? -But do you like it? -I do, I really like it. I think David might get the hang of this rather quickly. Just as well. Will has spotted something else. What do you reckon to that bad boy? not too big, so it's, you know, accommodatable. If that's a word! It evokes the Fens, in my mind. -There's one held every year, just down the road. So something like this, when would it have been used until? maybe even could have been used recently after the Second World War. I think that might have potential. Shall we find out what it costs? Yeah, let's find out, because I like that, I do like that. Well, it's worth a shot, I suppose. Over in Newmarket, have our other pair agreed on anything yet? but they are sort of measuring jars, aren't they? They look really unusual to me. Well, they are not that unusual, but I think they are £10 each. Yeah, let's forget that, then. Don't humour me, let's go somewhere else. I thought I was doing quite a good job then! Well, what did you have in mind, then, Mark? Are you a porcelain lady? Do you know, I walked past those earlier. but I'm just going to be told they're tacky. No, they are not. Do you want to take that one? Yes. Are they not tacky, then? I don't think so. They're French porcelain. -So I did have an eye! I was thinking they are bit gaudy, I'll be told that's a bit naff. because that was the taste of the day. I quite like that sort of pale peach colour as well. I just love the whole thing, yeah. I mean, they're very flamboyant, aren't they? Hurrah, something on which they both agree! With a ticket price of £79, Naz is here to talk money. -..and we quite like them. It's my first chance at bartering, hang on. Could we have them for cheaper, please? Are you willing to barter with us? Give me a figure, then we'll work from there. -Go on, then, what would you say? -Can you come up a little bit? Oh, my gosh! Did we just buy it? -Oh, is that it now? I was in full flow there! I think we could have got it for 45. Never mind, that's the first purchase of the Road Trip. Great! The Etruscan style vases for £50. Well done, Carrie. Now, how are the chaps getting along? I do like the look of this. Well, glad we cleared that one up. So, now, what would this cost? What if we had these two together? Are you liking the saw still? I still like the saw. -What did you say for the saw? I thought we said a tenner? Here we go. Nice try! But Stan still wants £15 for the saw. which would loosen the soil in your garden, and Stan's asking £25. and taking both of them, would that be...? Oh, that sounds like a very fair offer. Boys, I could shake hands at £30, it's here and now. Come on, let's do it, let's get that first buy done. -And we have a plough. -All we need is a farm. Oh, come on! I think I saw one on the way in. Right, let's see if it's for sale. Hang on, we haven't paid him! We agreed on £30, yeah? is £100, which I would really like you to have. What are you up to, David? In exchange for what we've already got and the boar's head. Oh, that was a cheeky move. but I want you to have it. -Put it in your hand. -I couldn't do that. There's still meat on the bone there, boys. £100, you know, that's only a good dinner. -What do you want for the boar's head, then? -Oh! I still want 120 for it. That's me on that, I'm afraid. -120, yup, so 150 in total for the three items, guys. We got there, and the boys are off to a flying start. Back in Newmarket, it looks like Mark is on to something else. Carrie, come and have a look at these. Those little winning trophies there. -And they are modelled on horseshoes, aren't they? for this particular area of the country. So can we find out how much they are? Time for round two with Naz. There are great fun, aren't they? -I think they are just tin. What's it called? What do you keep a horse in? -I've got to trust you with me horses! These plaques are priced at £178. I'm keeping your hands well away from this deal. You just hold them all and it'll keep you occupied. That's a whopping £155 on their first two items. -Well, I'm pleased with these. and their new friend, don't you know? Boris the boar! Boris the boar. Oh! I've always fancied a fourth child. lies a hidden footballing past. had an out of London team. It was always Manchester United. I started going to watch Liverpool whenever they were in London. John Barnes is your cousin? The legend that is John Barnes is my cousin. -Oh, my God, how cool is that? is responsible for the rise of the world's most popular ball game. Football fan Alan Ward is on hand to tell them all about it. Alan, I've never known that this was the birthplace of football. that the rules were written down in one place, here at Cambridge. Well, it was a pretty lawless game! Football's British origins began as a mob game. and ending up with gangs of men brawling in the streets. It sounds like a really violent game. because people didn't have any time off from work. extremely violent, lots of people hurt and injured. because people weren't able to go to work the following day. Lots of people were injured and hurt. although they continued to be played in some areas as annual spectacles. of the game, but the rules remained ambiguous. Some schools allowed the ball to be handled, others did not. who came from a different school very difficult, naturally. how did they decide which rules they were going to play under? Was at the home team that decided? "Well, why don't we all just play to the same rules?" and that's the first time that the rules were formalised. was agreed by more than one college football team. Alan has very kindly recreated the pinning of those rules today. and no player must be tripped or pushed or held back by hand. It's, like, things that we really take for granted. but within 15 years the Football Association was created. The FA used the Cambridge rules to form the modern game of football. and sharing this new game with the world. footballing nations owe their footballing origins to Britain? Slightly embarrassing that we are not any better at it, isn't it? Come on, let's go for it. Come on, lend us the ball! Hey, pass the ball, lads. at Clare Antiques & Interiors. -Hi, nice to meet you, I'm Carrie. Good to see you. We are going to have a good look round. There's no hanging around, and just as well. Carrie, surely you can persuade Mark to take a gamble on something. I'll just leave you with that thought for the day. Maybe Mark's right about that one. Well, that's pretty, isn't it? Yes, you can take the glasses out. You look like a doctor! You look as if you're just about to analyse me. If my head's like that, I'm fine. It really works. -But I love the case. Do you know what it's made of? It is, mother-of-pearl, an abalone shell. -And it's made of papier mache. That dates to about 1890. -You really like this, don't you? I really, like, instantly warm to those. There's £28 on the ticket. Time to talk money with dealer David. Look out! -with these vintage spectacles and the glass case. we're wondering whether we can get a really good price on them. -I'll certainly do my best. Well, we were wondering whether we could get it for 15. I can't do 15, Mark, but I could stretch to 18. -Thank you, we love 18, thank you. -Carrie, what can I say? We've ended the day on a high. and wraps up shopping on an eventful day. to catch up before they kip. -Like, "I'm going to be able to do that!" They get on well, don't they? It's a new day and time to compare notes. Will was just so good. He corrected me in a really nice way. "Yeah, that's interesting. Do you like that?" "That's interesting. That's really good." Oh, really? Martin didn't do that. -Martin corrected me in a horrible way. -He just gave you the look. -He just gave me the look. but everything I showed her she seemed not terribly impressed with. leaving them £227 to spend today. I'm quite pleased with those. a rustic saw and a push hoe. Still, they have £250 to play with. what kind of things were you looking for? that would make a profit and beat you. So that was basically the criteria? Yeah, the same. Pretty much. OK, chaps, time for round two. Oh, look, here they are. Do you know, that sounded a lot smoother with Carrie driving it. because she doesn't actually give it loads. Do we not deserve the red car? I think you drove it beautifully. -I think we've earned it. You see, the red car is the winner's car. You haven't earned it yet. ..I'll buy you the car. Is matrimonial bliss suspended for the rest of the competition, then? ..how I got on yesterday and I told him that I'd bought everything. No! Are you trying to wind him up? -Are you playing games with him? Yes. I've been sending him secret texts calling him a loser. Is this something you do on a regular basis or just for the show? Oh, yeah, it's a competition. I'm not sure if David is competitive about the antiques or just the car. She has to earn driving this car by winning. As that's not going to happen, she may not drive it again. Exactly, she's had her chance, mate. is in the Hertfordshire market town of Hitchin. David and Will are at Marie Antiques for a rummage about. So off you go, lads. These are nice, though, aren't they, these hardstone pieces? -If you wanted to buy things for Carrie here. We're not buying for Carrie, we're buying for us for a profit. I would imagine, by the fact that it's a fish. Why's it shaped that way? You don't want to lose your salmon steak, do you? So you would cut it and lift it? Yes, that would be for passing the fish. Those bits... Serrated edges, or something? I think the shape is decorative and slightly humorous. and it will cost you 45 with no chips. It's not bad quality, actually. I think it's a bit quirky, isn't it? We've got Boris the boar, why not have Freddie the fish? Absolutely. Time to talk money with dealer, savvy Sheila. I'm not surprised, it's a beautiful item. But the price is just a little bit out of our comfort zone. Can you give me an idea of where we can go with this? but of course I will see if there is anything that we can do. I just need to go out the back to check that. Fingers crossed the owner is willing to give a little discount. -Good news or bad news? I think you're going to find this is amazing news. That's almost as unique as the fish slice. and so is this, because we're going to offer you that for £5. -He's straight in his pocket. I think that's a deal. That's an incredibly generous discount! With £40 off, the boys get a once-in-a-lifetime deal. They must be happy with that. Bonkers. Do you know what? I'm going to kick my heels up. as they head for lovely Letchworth. -I have a really big connection there. and it was just brilliant. She loved it cos she loved people. I know nothing about the history. -I'm sorry to say, ashamed to say. in cities worldwide is curator Josh Tidy. Where did it all begin, Josh? who was trying to solve the problems of the late-Victorian age. to the smoke and squalor of their industrial surroundings. and the average life expectancy was just 40 years. had a vision to change the way people lived. with an altogether different approach. and Lord Lever, who created Port Sunlight up near Liverpool. at increasing the productivity of the workers. and not just to do with increasing productivity. In 1898, Ebenezer Howard published his book, Garden Cities Of Tomorrow. that offered employment and the benefits of a rural lifestyle. including this one, the three magnets. It's a very simple idea but very neatly expressed. without either of the worst parts. So you end up with different uses for different areas of the town. You have areas for workers' housing so they can walk to work. so people can enjoy that. He wanted it really to be a network of associated towns. with the empty husk cos everyone had left. but Howard's ideas were a sea change in town planning. in what became the country's first green belt. rather than lining the pockets of landlords. became the world's first garden city. and zoned areas were the realisation of Howard's dream. excited to see what life in this new garden city was like. that were affectionately known as "cranks". and went with these smocks. That would have been outrageous at the time, right? by the rest of the country. People came up from London on a day trip to have a look at them. Forget the city, just look at the people! became a blueprint for new towns across the world. to Ebenezer Howard's dream of a utopian living environment. and are pootling west to Barton-Le-Clay. in this local antiques centre. Listen, just don't buy any more ploughs. OK, I'm sorted with that. There's plenty here for them to spend their remaining £245. How about you go that way and I'll go this way? Go on, then. See you later. That might be a goer for our rural lot. that I was really, truly excited about, was a camera. and I loved it, I cherished it, I loved taking photos. This reminds me of that excitement. First World War. This is from 1912 to 1914. Even before the war, people had these. In fact I really like this. David loves it and it is ticketed at £35. Hello, young sir, can I interest you in any fresh milk? I'm ready for the American football field. Really? I thought, to add to our country lot. So do you put two buckets on the end of those? -Two buckets, off you go. Do you think anyone would buy this? I don't know. Unless you want to veto me. No, I'm not the expert. and I want to try and spend as much as we can. It was at £48 and it's now £28. Tell me, what have you been looking at? I've been looking at these cameras. I love old cameras. -This one has particularly caught my attention. That's two items to think about. The owner of the yoke has left them their number. Time to make a call. and we wondered if you might be able to help us out. At the moment, you've got 28 on it. Would a nice round 20 buy it? Are you happy with that? All right, then, lovely. That's an £8 discount and the yoke is theirs. cos here comes the yellow peril. -How long have they had in here? -I have no idea, Carrie. Taking all the best stuff! Well, they are certainly trying their best, Carrie. -Carrie, we have no time to waste. -Let's get straight in there. Are we going to spend all our money? Only if it's going to make us lots of money. I'm finally getting the hang of it. These two have £227 weighing them down. That's a code for "no". Well, don't tell David, then! Although the boys have their eye on something else. It's like a... Maybe not mahogany. It's a fist, but check this out. It's a novelty pipe bowl carved in the form of a clenched fist. What do you reckon to that? What's that made of? What would that be? though I can't find a hallmark. It could've been used at a pre-hunt meet. It looks that kind of thing, doesn't it? To maybe have a little glass of sherry before you're off. -Oh! You have a man with a nose here. Whatever went in it, there's £22 on that beaker. They now have several potentials to consider. I say! How about Carrie and Mark? and it's, "Helen, from Roy, 8/6/1929." It's enamelled in this lovely lilac enamel. Gives it a lovely quality feel. -175? That feels like a huge risk. It is a huge risk, but do we like taking risks? -What would we say yes to? but if we could get it for 125 or less, it might stand a chance. -It is a good-quality item. Do you want me to buy this? I would like to find out what we could get it for. You do that then, Mark, and let Carrie have a gander. Oh, my gosh. That's adorable. I know, but it is lovely. It's worth a chance, isn't it? Hey, that would be a find. But that's a £50 discount for the cigarette case. Now it's the boys' turn to chat with dealer Steve. What shall we go for first? Let's go for this one. Steve has got the owner on the phone. -There we go. It's Judy. We've been rather taken by a little horn beaker. It's got 22 on it. Yes, I'm going to say yes to that and thank you very much. -Judy, thank you so much. Schmoozer. That's a £7 discount for the beaker. I'm not going to try and break your back on it. Would a straight 20 quid buy that? -You know what? Let's do it. That's £20 for the pipe and £15 for the beaker. Hope you've been watching, David, because it's your turn. that I could just part with now - around 20 quid? If I go to 25? This is all yours, remember. Shall I pass you back? £80 gets them the yoke, beaker, pipe and camera. You grab those, I'll grab the yoke. Let's hope it's a double-yoker, and their shopping is complete. -I wouldn't go in there. We've had all the good stuff. You've bought all the rubbish already? looking for a black cat. Anyway, come on. -Oh! Is he always that rude? Now you have the place to yourself. Actually, I'm quite impressed with you. -I'm so glad you found this because I can sit down. I like it for a couple of reasons. People collect children's chairs and it's a rocker. This is all turned, nicely turned. There is a lot of wear on that so people have used that. It tells of its history, doesn't it? But it is only £35. When is the Edwardian period? That was when Edward was around. I'll tell you what, I'm not needed. We've not seen Steve for a while, so let's get him back in. We want to be a bit mean if we can, sorry. -I knew this bit was coming. I'm sure the others were much nicer. we'd like to get it for about 20. 20? What's the price on there? -I thought it was 22, wasn't it? -I told you to shake his hand. Steve, thank you. We're thrilled with that. Oh, my gosh. We're going to make money on that. -We are all done. We're shopped out. This is a wild boar, or at least, WAS a wild boar. bearing in mind we're going to a rural auction house. to the rich farmer boys. - That's a good lot. - It's quite fun. The spoon is actually just silver-plated. It's also a fish slice. - But it's kind of fun, isn't it? - How much was that? We asked what her best price was. No! You're going to make money on that. The hand thing, what's the hand thing? - It's great, isn't it? - And you've put it with the horn? I've put it with the horn beaker, which again we picked up today. Hang on a minute, how many bits of this...? This is a lot, that's a lot. It is a lot. It's way too much. That's a lot, that's a lot. I think you've done really... They've done well. -I think you have, to be honest. -But they've done extremely well. - Hang on, we haven't seen your lot. - No, trust me, you've done well. - Let's have a look. - Shall we? You bought that in there, didn't you? - Carrie found that. 20 quid. - No way! -It was cheap enough at 35. And you've got the spectacles. They're French - Paris, probably. Etruscan style. They are really designer interior. And I wanted them for 45. - But Carrie shook hands at 50. - 50's still cheap, Mark. From the really agricultural to the delicate and tasteful. It's damning me with faint praise. On that note, I think we'd better leave. Oh, well, let's see what he really thinks. and he's gone very well with those porcelain vases. The little card case, the enamel card case - beautiful. but that spoon thing and the pipe, those two things. That spoon, I can't believe it. Five quid. The glasses, the Victorian glasses, I love. Yeah, that's quirky. And the chair. I think the chair is their good lot there. I really hope the silver enamel cigarette box does well. -It might come back to haunt you, that one. I don't like it when you wag your finger at me. for the auction in Downham Market. Has anybody got any pre-auction jitters? I feel like all of my bravado has left me. with the fear of being beaten. "OK, I'm going to lose." You still want to beat me. I'll still feel like I've failed. So is it a matter of who loses the most? Who loses the most is the loser, yes. Well, I'm glad that's straight. after his defeat at the Battle of Naseby. But who will trounce who today? Oh, I recognise that sound. Oh, no. Loving it. He's like a boy with a new toy. We hadn't noticed. Come on. Let's remind ourselves what they bought. ..while David and Will parted with £235. After combining a few things, they also have five auction lots. The little plough is, in actual fact, a hoe. We see them time after time. is probably going to make £10 at the outside. Now, the little cigarette case - absolutely delightful. And that could, again, top £100. his colleague Julia is first up with the gavel. First lot of the day is David and Will's silver-plated fish slice. Who'll start me with this? Start me with £20 on this nice little fish slice. What a really good buy. I'm so pleased for you. That's some result. I'll take that. and Mark adored the frog-mouth case. But will they take the fancy of the bidders? The glasses are actually inside it. Do you need them modelled? 14. 16, 18. £18 with me at the moment. -20 - £20 I have. £20 I have. £20 - any more? I thought they'd make more than that. Carrie's first lot of the day and it's a small profit. Your next best lot is coming up next. - This is my favourite lot. - Oh, I love it. Next, it's the combination lot of the treen pipe and beaker. Sale of the century moment, that. Start off at £20 on that. 25, 30. £30. 35, 40. £40, £40. 45, 50. £50 with me on the book. Oh, commission on it as well. 52. 55. £55 with me. 65. 65 on the book. They've got a lot of commission bids, haven't they? - £30 profit. - £30 profit. We're doing all right, we're doing all right. I'm quite relieved - we thought you might get more than that for that. Is that a compliment or what? Either way, it's two profits for the boys. That's all your good luck now gone. Hopefully, the good luck is heading your way, Carrie. It's your pair of vases next. - They're very stylish. - What a pair. Who will start me off? - Come up, it will come up. - No, it won't. It's only got £130 to go. He's grabbed a real bargain. But it's another loss for Carrie. Do you know, I really am disappointed by that. Next, it's Carrie and Mark's biggest spend. If it sells for 1,000, we might win. If it sells for 1,000, I'll give you the money myself. - Oh. - Well done, Mark. 110 anywhere? 110. 120 on my book. A voice at the back. -That could have been a lot worse. That's it, Mark, stay on the positive side, mate. Maybe a change of scenery will alter your luck. and here comes Barry to shake things up. 10 again, 12, I'll do it at 12. 15, 18, 18, 20, at 20, 20. Up the top at £20. Quickly, at £20. It feels really like someone's punched you. The first loss for David and Will in double-quick time. Stand by. David, I just wish you'd bought all the lots. We should have trusted you. Right, Mark and Carrie need to make a comeback. Next is their equestrian lot. Good luck, chaps. Your start for that one, 30, £40. 10, 12, bid at 12. 15 and 18, 18 and 20. I'm feeling for you, I'm feeling for you. 25, 25, 28, 28. 28, 30, at 30, 32. Someone's going to pay a tenner each for them. Not going to get over 50. At 50, come on, don't joke it off. One at the back, quickly, at £50. leaving Carrie and Mark with another loss. - Yeah, that's true. - I can't believe that. Boris, your time has come. Your start, 60, £70. A tenner. A tenner bid, 10, 15, 15, 20. 50, I've got on my book, at £50, 60, 60, 70. Come on! Oh, go on! On the shelf at 90. Are you all done? Round it up to 100. -Oh. We got away with that, just. it's still a loss for the boar. I realised he wasn't saying "17, 18, 19". because it's your combined agricultural lot next. At £15, and 15, and £15, 15, 18, 18, 18. 18, you're quick, at 18, 20. You going to go your age? 21. 22. 22, 4, 24. -It's 30, everything is at 30. -£30, away from you, quick, £30. Yeah, but it's still a loss. -Have we got anything left? -Yeah, you've got your chair. Which needs to make about £400 to catch up. It's our final lot of the day. Never before has so much rested on such a little chair. Right, I have bids on the book. - Oh! - Send them home, Barry. 18, 20, 22. 22, 22. -No more, he says, no more. -I think we've been just so unlucky today. Time to do the maths. leaving a total of £286.18. David and Will also began with £400. albeit a smaller one of £42.30. So after a final total of £357.70, they are today's winners. -But we're winners in life. -I've never celebrated losing before. - Well done, Will. - Cheers, Mark. -make the most of it, won't you? I am never going to forget this, you know that, don't you? Would you ever go to an auction again? Oh, yeah, I loved it, it's so exciting. -I tell you what's even better, though. -Having lunch. Shall we find a pub and have one? -Oh, all right, I'll pay. Celebrities hunt for antiques across the UK. Husband-and-wife vocal coaches David and Carrie Grant swap singing in harmony for battling it out with antiques. 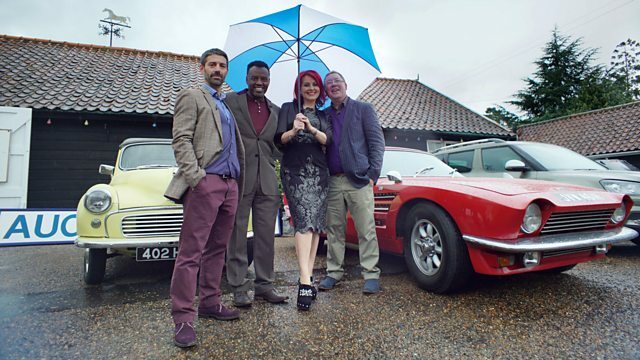 With the help of experts Will Axon and Mark Stacey, the competitive celebrity couple uncover some unusual items to sell at auction in rural Norfolk. David also visits a patch of inner-city grass in Cambridge, where today children play and dogs are walked, but which was actually the birthplace of football, while Carrie learns how Letchworth Garden City sparked a revolution in urban design.